The inside account of an iconic team in baseball history: the 1969 New York Mets—a consistently last-place team that turned it all around in just one season—told by ’69 Mets outfielder Art Shamsky, Hall of Fame pitcher Tom Seaver, and other teammates as they reminisce about what happened then and where they are today. Playing right field for the ’69 Mets was Art Shamsky, who had stayed in touch with his former teammates over the years. He hoped to get together with star pitcher Tom Seaver (who would win the Cy Young award as the best pitcher in the league in 1969 and go on to become the first Met elected to the Hall of Fame) but Seaver was ailing and could not travel. So, Shamsky organized a visit to Tom Terrific in California, accompanied by the #2 pitcher, Jerry Koosman, outfielder Ron Swoboda, and shortstop Bud Harrelson. Together they recalled the highlights of that amazing season as they reminisced about what changed the Mets’ fortunes in 1969. 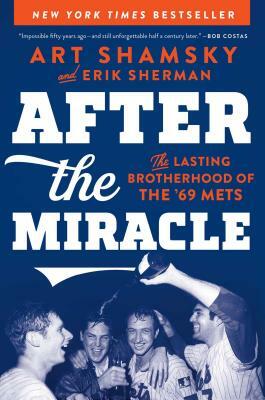 With the help of sportswriter Erik Sherman, Shamsky has written After the Miracle for the 1969 Mets. This is a book that every Mets fan—and every baseball fan—must own. Art Shamsky was a Major League baseball player for eight years, starting with the Cincinnati Reds in 1965 and then joining the New York Mets in the winter of 1967. He was an integral part of the World Championship team in 1969. Since his retirement from baseball, he has been involved in various businesses and worked as a sports broadcaster at WNEW-TV in New York City and on ESPN, and as a broadcaster for the NY Mets. He is also the author of The Magnificent Seasons: How the Jets, Mets, and Knicks Made Sports History and Uplifted a City and the Country. "Wasn't that a time? When the last became first and anything seemed possible, in baseball and in life? After the Miracle recalls those thrilling days for now-old boys like me, and shows a new generation of fans that losing serves only to sweeten victory. Warmly and wistfully, Art Shamsky and Erik Sherman reunite the boys of summer, fifty years later." "This heartfelt, nostalgic memoir will delight baseball fans of all ages and allegiances."